Graham Arader: Exhausting for me. For 47 years I have been dealing with competitors who steal their inventory from LIbraries. I have put 7 of them in prison working with outstanding FBI agents. Exhausting for me. For 47 years I have been dealing with competitors who steal their inventory from LIbraries. I have put 7 of them in prison working with outstanding FBI agents. A 1787 document signed by Thomas Jefferson. “Four Works Bound Together,” John Calvin, 1557-1572. And pages and pages sliced from rare books from the Carnegie Library of Pittsburgh are among more than 300 items stolen over the last 20 years. The documents, which include applications for search warrants, inventories from completed searches and affidavits laying out probable cause in the investigation, have been sealed since last summer. They reveal that a total of nearly 320 items were removed from the Oliver Room at the library’s main branch in Oakland, valued at more than $8 million. Of those items, dozens were recovered in the Caliban Book Shop Warehouse in Wilkinsburg during searches there in August, court records show. Among them, “Mathematical Principles of Natural Philosophy,” Isaac Newton, 1803, and “Philosophae Naturalis Principia Mathematica,” Isaac Newton, 1833. Also recovered were maps and plates and loose pages believed to have been cut from books in the collection. The affidavit noted the recovery at the warehouse of two Mercator-Hondius maps in a plastic sleeve, which also contained an eBay receipt showing a sale of the items for $149.99 from Nov. 2, 2008. The payment was sent to an email address of rarebkstore@hotmail.com, which investigators said belonged to Caliban. A search Thursday evening showed that Caliban Book Shop was offering a George Edwards hand-colored engraving, “The Blue Jay and the Summer Red Bird Print,” online for $120. A print of that name, according to a search warrant inventory return, was seized by investigators in August. Attorney Kayleigh Shebs, who represents Mr. Priore, said she had no comment. Robert G. Del Greco Jr., who represents Mr. Schulman, said his client is a highly regarded antiquarian bookseller. They estimated the loss to the library at $8.1 million. The Oliver Room remains closed. Investigators with the Allegheny County District Attorney’s Office were called in in June 2017 and, according to the documents unsealed Thursday, began executing search warrants in August. Among the places searched were the homes of both Mr. Priore and Mr. Schulman, as well as the Caliban Book Shop and warehouse. 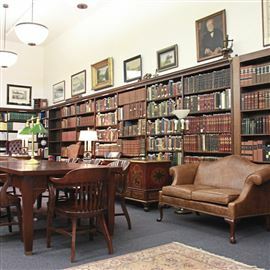 According to an affidavit of probable cause attached to several warrants, Mr. Priore was appointed sole archivist and manager of the rare book room in 1992. His job duties included preserving the history of the library, identifying items that should go to the Oliver Room and maintaining its contents. Mr. Schulman, the affidavit said, opened Caliban Book Shop, with co-owner Emily Hetzel, in 1991. When he first was interviewed by library administrators, the affidavit said, Mr. Priore told them that, although he never left a customer in the Oliver Room unattended, he occasionally would trust interns or cataloguers to be left with patrons. During the course of the investigation, according to the affidavit, appraisers with Pall Mall Art Advisors located both historic and current instances in which several of the library’s missing items were subsequently sold or advertised for sale by or through Caliban Book Shop. Among those items was a 1787 first edition “De la France et des Etats-Unis,” signed by Thomas Jefferson, which was discovered as being listed for sale online through Bauman Rare Books, which has offices in New York and New Jersey. Library administration said no items from the Oliver Room had ever been part of a deaccession. The affidavit alleges that the library header and footer were not aligned with the typed body of the memo. The affidavit said that, since a number of the stolen items have been advertised for sale both locally and abroad, it appears the motive for the crime is a financial one. According to the court filings, during its own investigation, library administrators did a review of Mr. Priore’s email account through Carnegie Library and found several messages between 2015 and 2016 in which he communicated with billing offices at Ellis School and Duquesne University. “In several of the Ellis School emails, Priore requested to have pending payment due dates extended. In one such email thread, dated Oct. 28, 2015, Priore stated, ‘I am trying to juggle tuition payments for four kids,’” the affidavit said. In other messages in late 2015 and early 2016, he asked Duquesne to lift holds on his children’s accounts so they could register for classes. In another set of messages to a property management company in February 2016, the affidavit said, he asked that a check be held because his wife had been unable to work because she had a heart attack the previous December. “Priore’s wife is a full-time employee of [Carnegie Library of Pittsburgh] with no record of any leave taken during that time period,” investigators wrote. Among records seized during the searches were bank and financial records from Caliban and Mr. Priore.